The KTV Group has more than 22 years of experience as a reliable and predictable maintenance supplier for condominium/housing co-ops/ business parks and property managers. 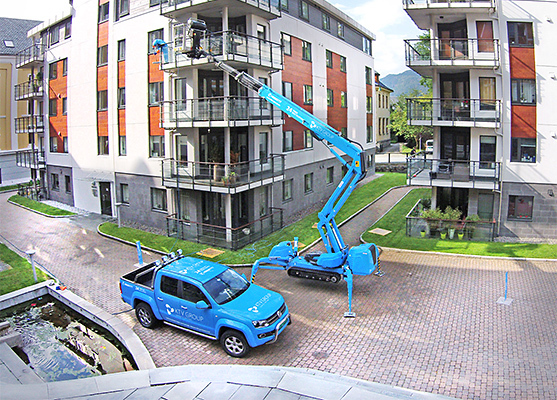 The KTV Group is the only company in Norway that offers long-term maintenance agreements lasting as many as 20 years. The KTV Group takes responsibility for maintenance tasks throughout this period, so your property functions properly. The KTV Group is currently responsible for maintenance agreements on more than 500 000 square meters of building space. BlueTag is our QA, documentation and business management system. The KTV Group works hard to deliver the highest level of service that includes a unique full-package documentation system. The customer is automatically sent his own weblink on our website as soon as an order enters our system. This is where the customer can find documentation from our work and services, 24-7. Documentation includes reports, images and videos, checklists, forms and other essential documentation. The KTV Group works hard to deliver the highest level of service that includes a unique full-package documentation system. The customer is automatically sent his own weblink on our website as soon as an order enters our system. This is where the customer can find documentation from our work and services, 24-7. Documentation includes reports, images and videos, checklists, forms and other essential documentation. • The facades on your building complex will always look modern (clean and welcoming), which increases enjoyment and values. Traditional maintenance only lasts two years before quality begins to decline again. KTV agreements provide annual maintenance. • We can prepare a design for exterior facades, outdoor areas, driveway etc. free of charge. Consider the fact that even old buildings can be freshened up using new, modern colours and minor changes in design. • Planned maintenance prevents challenges associated with clogged drains/sand traps or dirt accumulating in ventilation ducts.